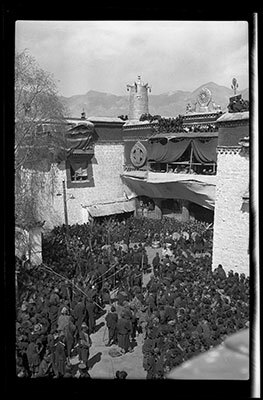 Large crowd consisting of monks, monk musicians and spectators in the courtyard outside the main entrance of the Jokhang. The occasion is the ceremony of the Lugong gyalpo (glud 'gong rgyal po) which took place on the 29th day of the second Tibetan month. On the left the Dalai Lama's window and to the left of that the lamp post may be seen. The Tibet Album. "Lugong ceremony outside the main entrance to the Jokhang" 05 Dec. 2006. The Pitt Rivers Museum. <http://tibet.prm.ox.ac.uk/photo_2001.59.9.1.1.html>.